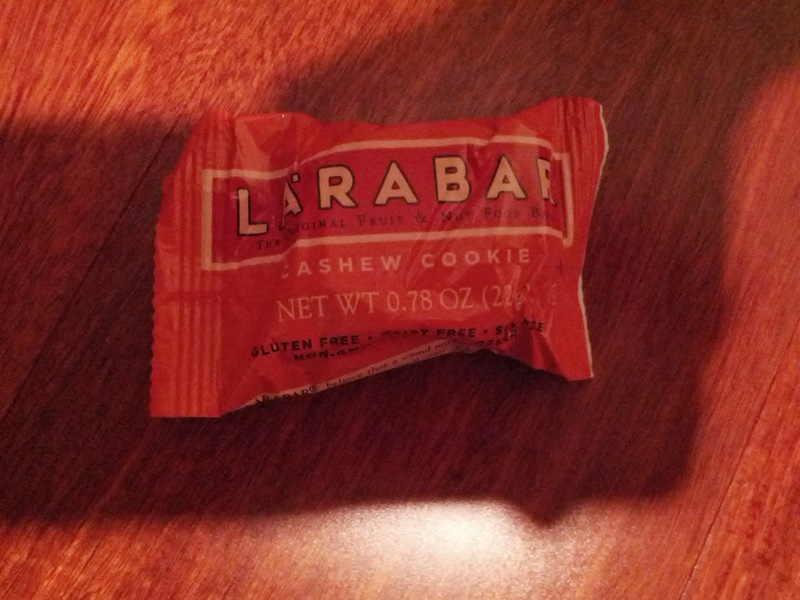 As you know, I'm always on a quest to find tasty snack bars to stuff in my purse. I have found some winners, but, generally, I dislike them. Granola bars are always dry and boring, protein bars tend to tasty funky, and the only ones I tend to like are soft baked breakfast-style bars. But I keep trying. LÄRABAR is rather near the top of my dislike list. 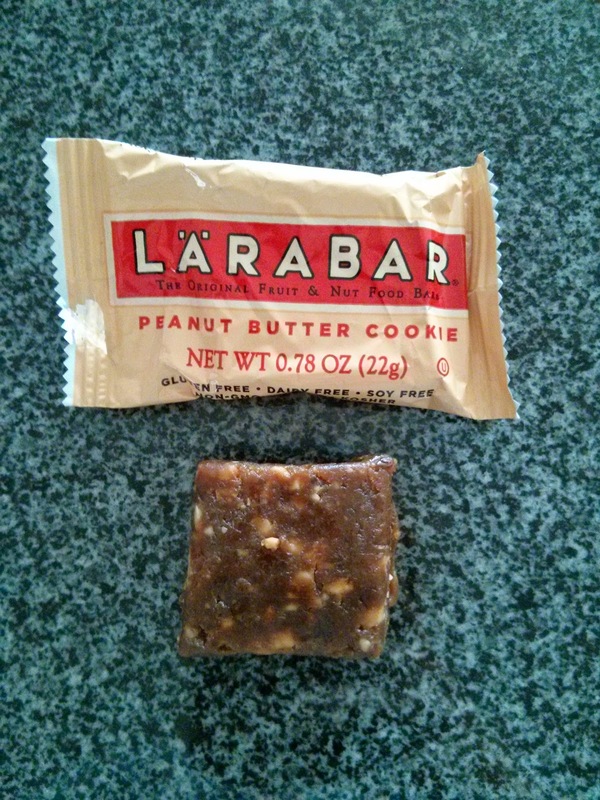 They make several product lines: the classic LÄRABAR, ALT protein bars, über snack bars, and Jŏcalat chocolate bars. I've only tried the originals and the über bars. 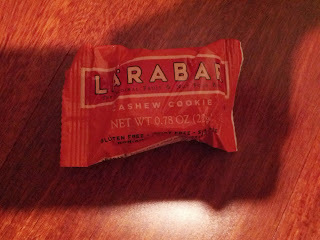 LÄRABAR is their original line, made from unsweetened fruits, nuts, and spices. Each bar has fewer than 9 ingredients. Most use dates as the base. The names of the bars sound like decadent desserts. They always tempt me, with their names alone. Spoiler: they don't remotely resemble their namesakes. They aren't tasty. Made from apples and dates, almonds and walnuts, and spiced with cinnamon and raisins. The aroma on this was really lovely. It smelt like a well spiced apple pie. So far, so good. But ... I did not like the taste at all. The apples were mushy, and although the dates provided a bit of sweetness, the nuts were sour and bitter. 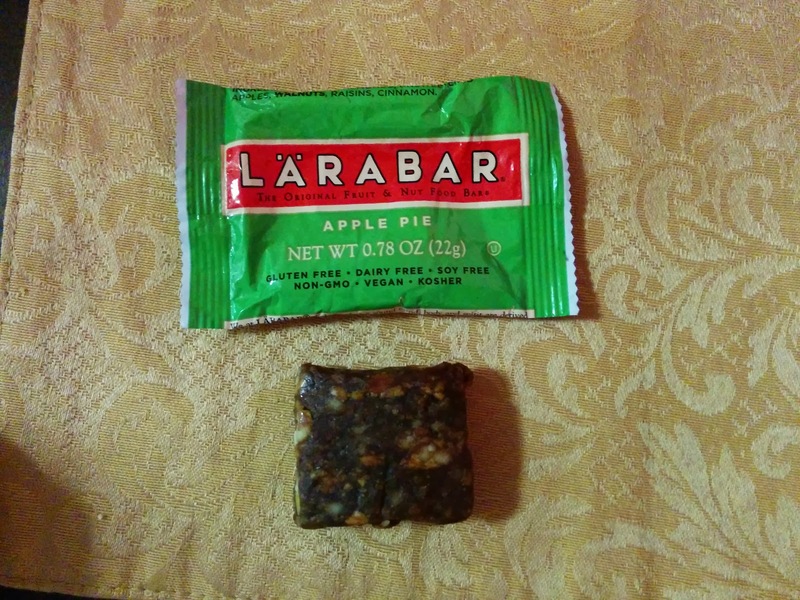 This was nothing remotely like an apple pie! Made from a base of blueberries and dates, with walnuts, lemon juice, and vanilla. Now, I like blueberry muffins. 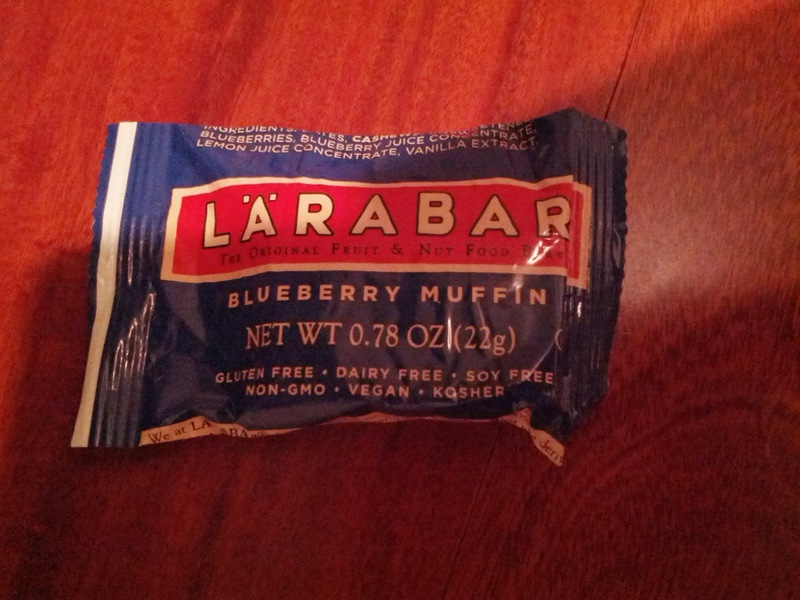 But after the "apple pie", you'd think that I'd be prepared for the Blueberry Muffin LÄRABAR to not remotely resemble a blueberry muffin. But ... 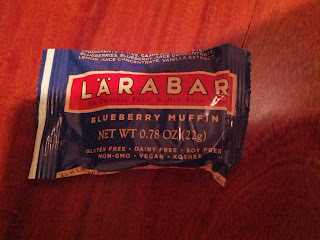 I was foolish, and still somehow thought that I'd find blueberry muffin inside. Instead I found ... surprise, nuts and dates. This time, with some blueberries, yes, but the dominant flavor was still dates, and the texture was all mushy. I didn't even want a second bite of this. Basically just cashews and dates. This was certainly nothing like a cookie. Did not like. Gross, gross. Same as the cashew "cookie", but with peanuts. I liked the peanut flavor, but, overwhelmed with date flavor. I just do not like these. And why, why, why do they name it "cookie"? Another base of dates, with peanuts and chocolate chips. Peanuts are good. Chocolate is good. Together they are better. I thought that would save the fact that it is still a date based bar but ... no such luck. 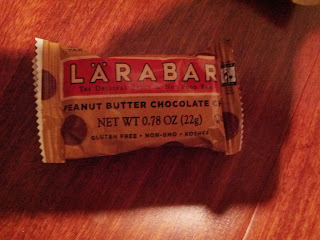 I just do not like the date base, and thought it tasted really strange against the peanut flavors. And the texture was all wrong. Do not like. 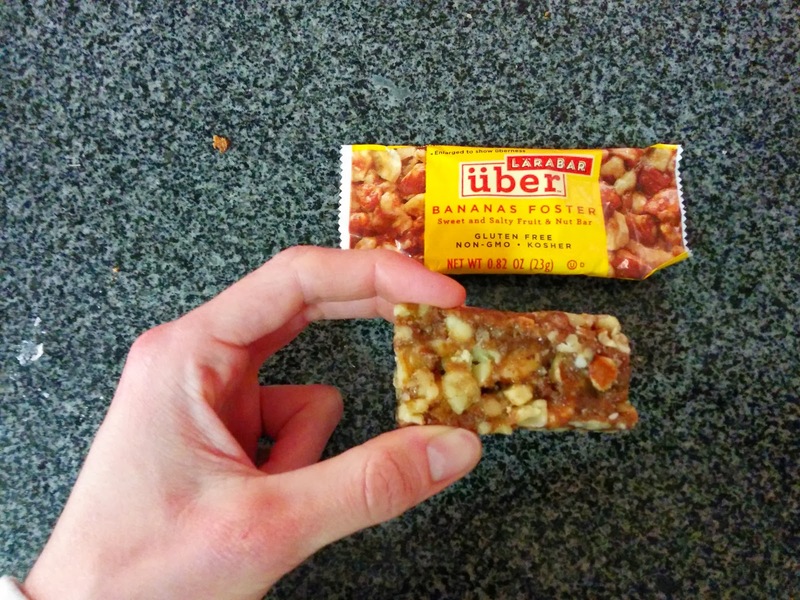 The über line is their fun snacks, a mix of sweet and salty, made from fruits and nuts. Made from almonds, walnuts, and pecans, along with dried bananas, sweetened with brown rice syrup and honey, held together with dates, and spiced with salt and cinnamon. This sounded very fascinating. Who doesn't love bananas foster? I was hoping for a sweet, nutty, banana-y treat. Instead, it really was just a bunch of nuts glued together, with a bit of a banana aftertaste. I think the name of it just made me expect, and want, something very different, so I didn't end up liking it very much. I could imagine it perhaps being good melted over some vanilla ice cream? But ... not just as a bar. Made from almonds, cashews, peanuts, pecans, macadamia nuts, sweetened with brown rice syrup and honey, held together with dates. Basically a bunch of mixed nuts stuck together with a slightly sweet date paste, salty too. Not bad … almost really good. Consolidated in master Pinkberry post. You've heard me rave about the local meal delivery service, Munchery, before. I've been using it for more than a year now, for everything from simple comfort food dinners, to a fun play on a Heston Blumenthal's Chocolate and Cauliflower Risotto, to my entire Thanksgiving feast. I've even used Munchery to get breakfast baked goods. My absolute favorite Munchery order, perhaps not shocking if you know me, was the pumpkin pie cheesecake for dessert. Well, my favorite before today that is. Munchery meals are prepared by individual chefs, so there is some variance in the quality and style of food, depending on the chef whose dishes you choose. But one chef I've had my eye on since she joined a few months ago is Chef Bridget Batson, previously executive chef at Gitane and Claudine. Her menus always sound really appealing to me, very vegetable forward, focusing on seasonality and lighter dishes. A few months ago, right when she joined Munchery, I tried her winter salad and shrimp cocktail, but I really wasn't impressed. I've wanted to try her cuisine again to give her another chance, but, Munchery only operates on weekdays, for dinner only, and I am provided rather spectacular dinner at work during the week. I really wish Munchery was available on weekends or at lunch time! I recently had a realization though - although their primary service is dinner the evening you receive it, there are some styles of food that can keep well for a day, and since the food is delivered cold and designed to be finished by you at home, this can work reasonably well. So when I saw Chef Batson offering a baked pasta dish on a Friday night, I speculated that it would still be fine for dinner on Saturday, and quickly sent the chef a message using Munchery's "Ask the Chef" feature to see if she agreed. I had a response minutes later, and, as I expected, she assured me it would make for an excellent Saturday night dinner. Everything about ordering from Munchery was easy as ever, from viewing the menus, to seeing the gorgeous photos of the dishes, complete with descriptions of each dish and what additional preparation would be required at home. My order arrived at the start of my selected delivery window, which, since I wasn't planning to eat it that night wasn't necessary, but was very re-assuring. When is the last time a delivery order ever arrived on time? But the best part? 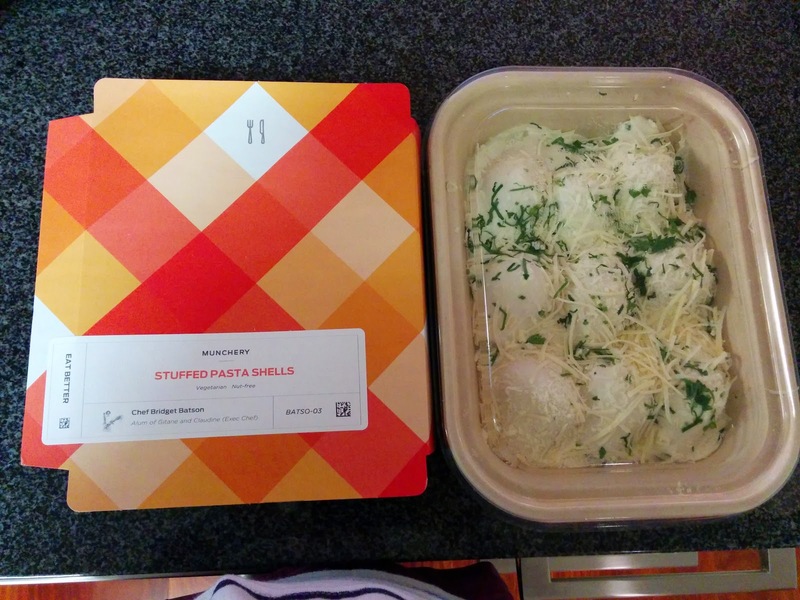 This was my favorite meal from Munchery so far. I'd order it again in a heartbeat. You should too :) If you are interested in Munchery, use my invite link, you'll even get $20 off your first order! Stuffed Pasta Shells: greens, ricotta cheese, cauliflower "cream". $10.95. "Large pasta shells stuffed with kale and Swiss chard braised with garlic and a pinch of chili, folded into ricotta cheese with lemon zest baked in a rich puree of cauliflower and Parmesan cheese." I've been really craving pasta lately. I'm not quite sure what it is, but something about a big bowl of warm pasta seems so appealing. Perfect comfort food. I was particularly interested in the stuffed shells from Chef Batson, because I know she likes to incorporate a lot of vegetables, and takes a healthier spin on dishes. This sounded like it would still tick all the boxes of cheesy comfort food, but sneak in some serious vegetables and perhaps not be too heavy? I opened the package the moment I received it, just to check them out. The dish didn't actually look that great. Shells in a kinda thick white sauce. Herbs sprinkled on top, along with unmelted cheese. I know the idea with Munchery is that I finish the cooking at home, so the cheese would melt then, but it still didn't look all that appealing. I re-packaged the shells into a plastic container, since I wasn't sure about leaving them in cardboard for the next day, and hoped for the best. The instructions said to reheat at 350 degrees for 3-4 minutes. I was skeptical. How would they possibly warm up that fast? And, indeed, they didn't. I heated them for at least 10 minutes, and then finished them under the broiler. The aroma coming from my toaster oven was incredible. As I pulled the casserole dish out, and all thoughts I originally had about them not looking impressive vanished. They cooked up beautifully, I wish I had taken a photo of the finished product. Piping hot and bubbly. The cheese that made contact with the edges of my casserole dish was crispy, and the edges of the shells got a bit crunchy, exactly what I was aiming for with the broiler. They were too hot to dive immediately into, but I enjoyed waiting for them to cool for moment, as they smelt incredible. I was honestly happy just sitting there inhaling the garlic aroma. I had even almost convinced myself, in my mind at least, that I was about to sit down to a home cooked meal, the smell so permeated my apartment. My happiness grew as soon as I took my first bite. Inside the shells was, as promised, a mixture of kale and Swiss chard, finely chopped, braised with garlic and chili, along with ricotta cheese. As I was hoping, there was a plentiful amount of the greens. Don't get me wrong, they weren't just filled with greens, there was plenty of ricotta as well. The balance between the ingredients was just right. You could taste the ricotta, it was a creamy filling, but the flavor of the greens was the amazing part. The garlic that I could smell was evident in the filling, but didn't overwhelm. Little hints of chili made the flavors pop even more, but again, didn't overwhelm. And the acidity from lemon zest just accented the flavor of the greens. Seriously delicious filling, and the shells were a great vessel for it, but it could easily be used in any form of stuffed pasta, or in layers of a lasagna. The shells themselves were standard large size pasta shells, well cooked, and did not get mushy waiting a day to consume. I liked how I crisped them up a bit when I heated the dish, but if you just heated them without the broiler, I think they would have been fine too. The final element was the one I was most skeptical of: the sauce. I love sauces. I'm such a sauce girl. I like cauliflower, I've even had my share of cauliflower mac and cheese or mashed faux-potatoes using cauliflower, but I wasn't exactly excited about a cauliflower sauce. In my head, stuffed shells really should have a red sauce. Or, if it was going to be a white sauce, it really should be a very rich alfredo. Cauliflower puree? Hmm. I needed not worry. Like everything else in the dish, it totally delivered. It was creamy, and yes, it did taste like cauliflower, but, it did so in a way that just worked. I think because you could taste the greens so dominantly in the filling, it made sense to also taste a vegetable in the sauce. And, just like the filling, the sauce did clearly have cheese, in this case parmesan, so it was still comfort food. Everything about this dish was just spot on. It was an example of how you can lighten up a classic dish like stuffed shells to incorporate vegetables, yet still keep it feeling fairly decadent, but simultaneously not weight you down. It was a demonstration of ingredients in perfect harmony - just enough cheese to satisfy a comfort food craving, balanced by the right amount veggies to feel healthy, enough chili pepper, garlic, and lemon zest to make all the flavors pop, but nothing dominating. I have a hard time imagining anyone this dish wouldn't please. Even if the ingredients don't sound amazing to you, the way they all balance out creates a truly phenomenal dish. While not high end cuisine, I'd gladly order this at an Italian restaurant any day. I'd obviously order this again. It worked perfectly for a next day meal, which is very encouraging for me, since I don't normally order from Munchery since I don't need weeknight meals. If you managed not to eat it all, or perhaps ordered an extra, I'm guessing it would freeze well too. If you wanted to impress your friends, you could order a big batch and serve it at a dinner party. It is "simple" enough home cook food that no one would doubt you prepared it, but they'd be blown away by the skilled application of flavor. When I placed the order, $10.95 seemed maybe a bit high for "just pasta", but the serving size was very generous. Ojan and I were able to split it for dinner, with a salad on the side, and a half serving was perfect. And, while you can probably get cheaper stuffed shells at some Italian restaurants, I guarantee they would not be this good. Order this dish. Now. Merged into my main Godiva review.